Gutentype is a modern, attractive & responsive Blog WordPress Theme. 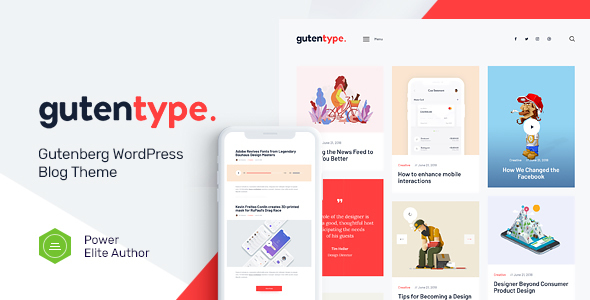 If you are a writer or a blogger and write articles, stories, world news, have a travel blog or entertainment blog, share your article or lifestyle story with Gutentype. Also the theme works for viral blog, personal travel blog. It fits entertainment blog projects, professional magazine, niche blogs etc. It features full support of Gutenberg. Also it has an Instagram Feed, MailChimp for WP, Contact Form 7 and multi-language options.